Plastic Fish Bowls give you convenience when you want to store and sell small items such as candy, small toys, hair bows and more. Plastic material is easier to use, if containers happen to shatter - no worries about glass slivers for your customers to get hurt on. Plastic containers made of durable material is easy to transport for tradeshow openings, shops, weddings and amazingly displays bulk merchandise such as colorful candy pieces on candy buffets. When you purchase our wholesale plastic fish bowls, they are affordable enough for you to purchase the contents too. 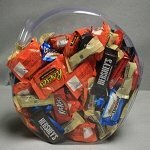 Be creative with these uniquely dependable candy jars. When plastic containers are in place, they can take the tumbles caused by your pint-size customers. Set your thoughts on your displays instead of worrying. The great thing about our plastic fish bowls in bulk is having them on-hand when you come up with a great idea on using them. Imaginably increase income! That's the bottom line. Order yours now while supplies last. Try out wholesale plastic fish bowls for safe storage! If you are looking for containers with racks, simply click here.